I’m very fond of this short but quite intense slow blues ballad by the unknown Al Anders. The plodding backing shows the label’s low budget to good effect but Anders’ grit and hoarse “yeah yeah yeah” flourishes carry it off. The disc comes from LA. 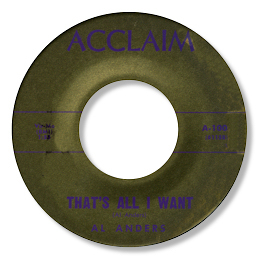 "Al Anders is the secular name of Al Andres, a gospel singer with a number of releases dating from the early 60s to the mid 80s . In the mid 60s he fronted the Mighty Golden Tones who recorded in Nashville for the Nasboro label including the single released in January 1965 "Just One Look In The Book" (Nashboro 655) which you can find here. Their next release included Andres 'It's Time To Testify' (Nasbor 874) that he subsequently reprised on Jewel and Sav-A-Soul. There are several groups called the Mighty Golden Tones so other releases featuring Al Andres (Anders) are hard to verify although a release out of Durham, N Carolina on the Dixie label 'I Believe' is a strong possibility. As Bro Al Andres he released "Lord, Look Down On America" parts 1/2 (Jewel 235)' (re 12/74), & "Testify" / "He's Able" on Jewel 227 /Jewel 238. The latter coupling also appeared on a North Carolina gospel label called Sav-A-Soul 02 credited to Al Andres and the Lillingdon Community Concert Choir. The Sav-A-Soul label which was owned by Andres released sparodic 45s and LP's from the 70s to the early 80s. Andres (Anders) is recorded as producer and writer on many of these releases. The earliest records carry a Dunn, N Carolina address but the majority have an address in Lillingdon, North Carolina. The latter releases are from Charlotte. There exists an LP on Sav-A-Soul by Bro Al Anders & the Lillingdon Community Concert Choir entitle 'God Make A Way' (Sav-A-Soul 123). He was most likely singing with the Mighty Golden Crowns who had two gospel LPs written and produced by Anders. Another 1981 single 'Pray for America' was leased out to an Atlanta gospel label Eternal Gold Ltd."
I'm very grateful to Greg as always for his great detective work. Much of Greg's info came from the excellent "Just Gospel" website run by Ray Mears which you can find here.